Tech Transfer - CubeWorks, Inc.
"LONDON — A resistive RAM non-volatile memory technology that could be embedded in SoCs and used in multilayered terabyte memory ICs is being brought to market by a well-backed and well-connected startup called Crossbar Inc.
Startup Crossbar emerged from stealth mode Monday to announce its version of RRAM (resistive random-access memory), a new type of memory that could be a successor to flash storage and DRAM. The company, founded in 2010, will make and license its RRAM, a nonvolatile memory, which will be smaller, faster and more power-efficient than NAND flash and RAM, said George Minassian, CEO of Crossbar. "It is higher density ... and the current is much lower," Minassian said, adding that the memory's physical and power attributes make it a suitable replacement for storage in smartphones, tablets, PCs and servers. Crossbar is claiming RRAM will deliver 20 times faster write performance, 20 times less power consumption and 10 times more durability than NAND flash. The memory chips will be stacked, and a 1TB module will be roughly half the size of a NAND flash module with similar storage, Minassian said. He could not estimate the price of a 1TB RRAM module, but said it will cheaper than NAND flash partly because RRAM is less expensive to manufacture. Crossbar will also license the technology to third parties. It could be two or three years before the memory shows up in products, but that depends on demand for the product, Minassian said. "It's a matter of what company appears at what time," Minassian said. RRAM differs from the way NAND flash and RAM operate. 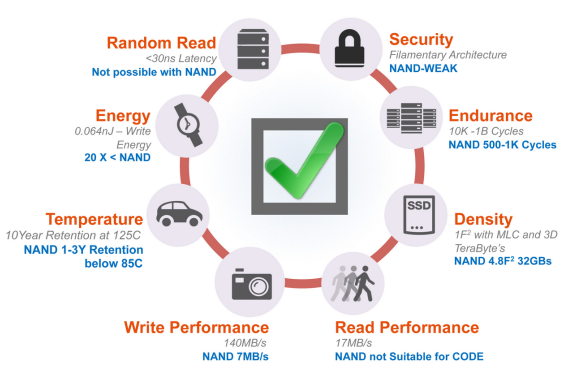 Unlike NAND flash, Crossbar's technology does not use transistors or trap a charge. Instead it uses a layered approach to store data. An RRAM cell has three layers, with a switch in the middle that helps determines whether the cell is storing a 1 or a 0. The top layer has a metallic electrode, while the lower layer has a nonmetallic electrode. The top layer passes metal ions into the switching media and into the lower layer, which creates a filament to keep the electrodes connected, what Minassian called a "short wire." Applying a negative charge breaks the wire and leaves a gap between the electrodes, which leaves no resistance, changing the status of the memory cell. "This is not a gate you use in standard NAND and NOR. This is resistive, which is where RRAM comes from," Minassian said. RRAM uses existing material and can be made in factories. Prototypes are being made in factories of TSMC (Taiwan Semiconductor Manufacturing Co.), Minassian said. Crossbar's RRAM doesn't contain transistors, so it is easy to make as chips become smaller, Minassian said. Crossbar's technology is very interesting and could be useful as manufacturing technologies improve and chips get smaller, said Jim Handy, principal analyst at Objective Analysis, in an email. "It's generally accepted that something is going to replace NAND and DRAM someday, since these technologies have scaling issues. When that will occur is unclear," Handy said. It is becoming more complex to make NAND and DRAM as manufacturing technology improves at a rapid rate, Handy said. Intel, which has the world's most advanced chip factories, will soon move to the 14-nanometer process to make its chips. Manufacturing smaller chips with more features requires more attention to detail, and chips could be vulnerable to a wider class of defects. "With that in mind, and with the advent of 3D NAND as a successor to today's planar NAND, there may be another five process generations, or even more, before alternative memory technologies have a shot at replacing NAND flash. The story's probably the same for DRAM," Handy said. Once a scaling limit has indeed been reached, technologies like Crossbar's RRAM will rapidly take away market share from the entrenched players, Handy said. Other RRAM designs are being researched by academics and research institutions. Alternative forms of memory to NAND and DRAM also include Everspin's MRAM (magnetoresistive RAM) and PCM (phase-change memory), a memory type being pursued by Micron and Samsung Semiconductor. 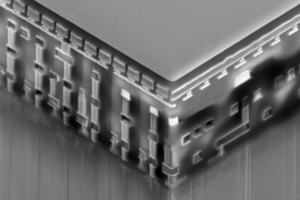 Hewlett-Packard is making a memory type called memristor. Several kinds of chips are used to store data, all of them good at some parts of that job but not others. A company called Crossbar has been quietly planning to disrupt a big chunk of that memory market. The Silicon Valley startup on Monday becomes the latest to unveil plans for an alternative to flash memory, the mainstay storage technology for products like smartphones, tablets and digital cameras. NAND flash, the most widely used variety, is less expensive than some competing technologies per bit of data stored. But NAND chips are slower at writing data than retrieving it. Moreover, chip makers fear that continuing to shrink NAND circuitry to boost storage capacity will soon become difficult or impossible. Crossbar says it has developed a variant of a technology called RRAM that is 20 times faster than NAND, consumes one-twentieth the power, stores data 10 times longer on chips that could be half the size. A single chip based on its technology could store a trillion bites of data, or a terabyte, Crossbar says. By comparison, the highest-capacity NAND chips now on the market store 128 gigabits of data, or 16 gigabytes; storing a terabyte would require 64 of those chips, notes Jim Handy, a market researcher with Objective Analysis. There are benefits beyond simply increasing how much data mobile devices and other gadgets might store, says George Minassian, Crossbar’s chief executive officer. For one thing, the slow data-writing speed of NAND flash means that many devices also have to have another kind of faster chips–DRAMs, or dynamic random-access memories. They are used for purposes such as temporarily storing images from digital cameras to minimize big delays when shooting photos, Minassian says. Those DRAMS won’t be necessary if Crossbar’s technology takes hold, he says, further reducing the cost and size of consumer products. “You can take photos as fast as you want,” he says. Some of this may sound familiar. The list of companies pursuing new memory alternatives is long. Some of the new devices have reached the market, but others remain largely an unfulfilled promise after years of investment. Crossbar’s technology is based largely on inventions credited to Wei Lu, an associate professor of electrical engineering at the University of Michigan. The venture capital firm Kleiner Perkins Caufield and Byers put up money to fund research on the concept, and later backed Crossbar–the exclusive licensee of the underlying patents. Where conventional memory chips use electrons to store data, Crossbar’s technology is based on tiny filaments that are formed by applying electricity from electrodes to a layer of amorphous silicon, a non-crystalline cousin to the silicon used in conventional chips. These act like on or off switches to record the presence or absence of a bit of data. Crossbar claims that its variant of RRAM, or resistive random-access memory, is simpler than others and can largely be fabricated on production lines now used to churn out conventional chips. It can also be used to create multiple three-dimensional layers of memory more easily than the widely used approach of creating separate chips and subsequently stacking them, Minassian says. The company is announcing its plans after developing working prototypes based on the technology. While Crossbar may make and sell some chips of its own, it plans mainly to license its technology to others–first to store data in specialized products known as SoCs, for systems on a chip, and eventually to makers of standalone memory chips, Minassian says. Handy says Crossbar’s approach has some advantages. But he argues that its inventions and other alternatives don’t really deserve much consideration until they prove that they can beat incumbents on cost once mass production begins. Another analyst briefed on the technology, Greg Wong of Forward Insights, echoed the challenges but said Crossbar definitely made an impression. “It definitely looked interesting,” he said. The company has raised $25 million and reached the prototype stage with just 20 employees. Minassian estimates that commercial products based on the technology are about two years away. They can’t come too soon for Lu, who says the fundamental idea for the technology came from an accidental discovery in 2004 during a stint at Harvard University before he joined the Michigan faculty. Applying extra voltage to a tiny wire that contained amorphous silicon had some surprising effects, he recalls. "A U-M startup marketing next-generation computer memory that could write 1,000 times faster than Flash is the recipient of U-M’s first investment in one of its own spinout companies. This financial investment into Crossbar Inc. kicks off a unique new initiative designed to help propel technologies into the marketplace and deliver strong returns on the university’s endowment.